Nora Bouzihay (’15) Founds Nowara Co. and Pursues Ph.D.
Nora Bouzihay, a doctoral student of education at the University of Arkansas at Little Rock, became the influence that she wanted to see. She was the first female in her family to graduate from high school, attend college, obtain a bachelor’s and master’s degree, and pursue a doctorate. Bouzihay’s parents had always stressed to her and her siblings the importance of getting an education. They traveled from Morocco, a country in North Africa, to the United States as a young couple to provide a better life for themselves and the children they planned to someday have. From the start, they realized education would be the key to their children’s success. When Bouzihay completed her tenth-grade year at Nettleton High School, she made a decision that would put her educational pursuit into overdrive. She was accepted into and attended the Arkansas School for Mathematics, Sciences and the Arts (ASMSA) in Hot Springs, Arkansas. Once Bouzihay became a freshman at UA Little Rock, she was more than confident in her ability to succeed in higher education because of her pre-college experience at ASMSA. Bouzihay understood that she would encounter challenges that were unique to her, so she did everything in her power to ensure that none of those obstacles slowed her stride. While weaving her web of connections and opportunities, Bouzihay stumbled across a program that changed the course of her quest as a future scientific researcher. Although she’d enjoyed being a part of the Donaghey and Science Scholars programs at UA Little Rock, it was the National Model Arab League that resonated with her inner self. The National Model Arab League is a student leadership development program designed to give students a taste of life as international diplomats. Once Bouzihay graduated from UA Little Rock with her bachelor’s in biology, she took her talents to the Clinton School of Public Service where she learned the ins and outs of diplomacy through public service. As a requirement of the master’s program at the Clinton School, Bouzihay was tasked with choosing an international location for her public service abroad. Bouzihay was cleared to study in Dubai and spent eight months working with the country’s U.S. Department of State and United Arab Emirates. Once again, Bouzihay was on her own. This time, however, she found herself in need. Nine days after she arrived in Dubai, Bouzihay’s appendix ruptured. Bouzihay’s mother rushed to the Middle East to be by her daughter’s side and helped nurse Bouzihay back to health. Once Bouzihay was able to work, she did so non stop, so much so that she was asked to extend her semester-long stay in Dubai to work on other projects, as well as projects in Morocco. This time allowed Bouzihay to reconnect with her roots and visit her family. Her grandmother in Morocco had fallen ill and was hospitalized, so Bouzihay felt joy, comfort, and security being by her side, helping care for her grandmother. Bouzihay’s grandmother passed away last spring, and to honor her legacy, Bouzihay dedicated her master’s degree to her. 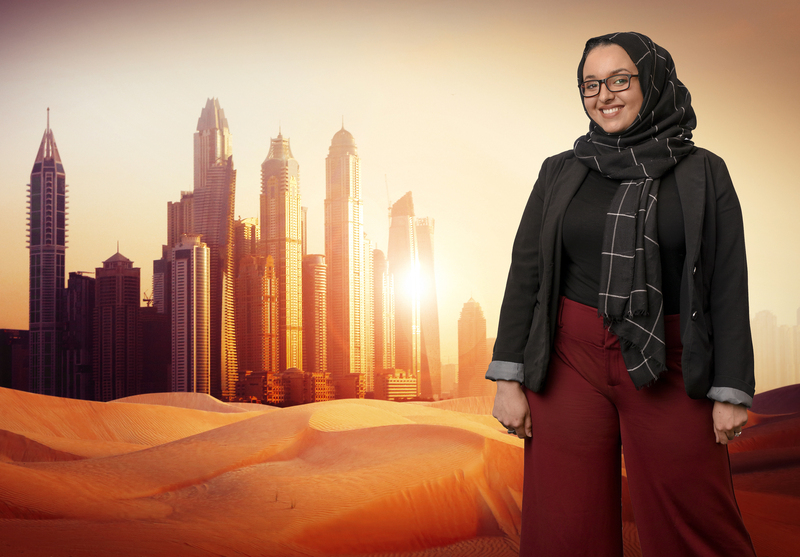 Following her experience in Dubai, Bouzihay was sure of what she wanted to do with the rest of her life. Rather than becoming a medical doctor/biomedical researcher as she’d once imagined, Bouzihay longed to work with women and children in the Middle East and North Africa to create a pathway for their future. To turn this dream into a reality, Bouzihay started the trek to obtaining her doctoral degree. She is currently working on her Doctorate in Education at UA Little Rock, while serving as a graduate assistant for undergraduate academic advising and working with first-generation college students and minorities. Although Bouzihay has a load of responsibilities on her shoulders, she’s made room for one more. She recently launched her own hijab/scarf company, Nowara Co. Nowara, which means “flower,” was the nickname given to her by her grandmother. “Nowara Co. was a continuation of my grandmother’s legacy to instill in and empower young girls and women to embrace their natural [beauty],” Bouzihay said. For every three scarves Bouzihay’s company sells, one will go to a refugee in the Middle East. Although refugees receive, food, clothes, health supplies, and water, Bouzihay says they do not receive scarves. About a year and half ago, Bouzihay committed to wearing the hijab daily. Although she was first uneasy of the looks and backlash she would receive from people outside of the Muslim faith, she felt fulfilled in making that decision and wanted other women to feel free and proud, just as she did, when wearing the scarf. Bouzihay has been more than an inspiration to her friends and family. She’s established a legacy through education, diligence, dedication, and resilience. After graduating from UA Little Rock for a second time, this time with her Ph.D in 2022, she plans to take and pass her foreign service exam, head to the Middle East, and do the work that she loves.